Everyone's growing up spending their birthdays, anniversaries, graduation and more with the number 1 bakeshop Red Ribbon. 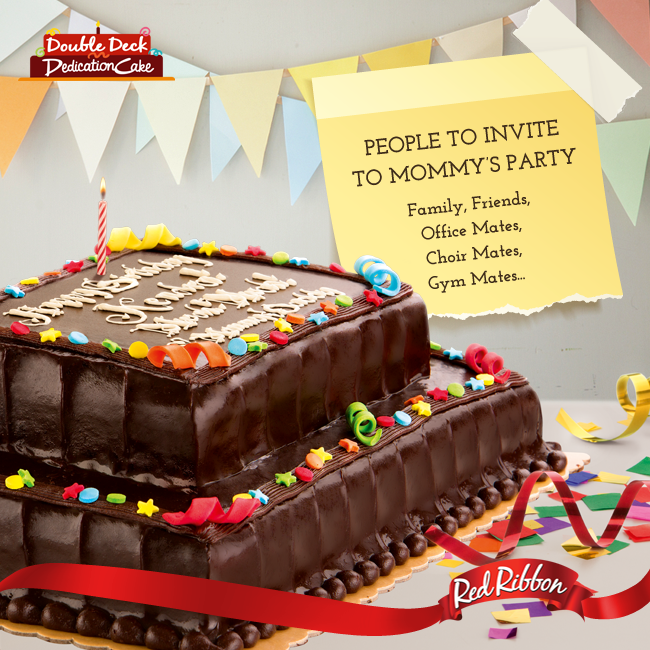 Now, Red Ribbon offers you a new double deck celebration cake for the whole family and barkada to enjoy. Cakes have been integral in every Filipino celebration, more particularly during birthdays. This time, Red Ribbon—one of the leading bakeshops in the country—is offering a double treat to your loved ones with its new Double Deck Dedication Cake. This two-layer cake offers more layers of chocolate goodness to make your child’s party an even happier birthday. With its layers of bursting chocolatey flavor, your child’s guests will surely line up for more slices. According to Zinnia Rivera, general manager of Red Ribbon, the new Double Deck Dedication Cake is a rich chocolate cake with fudgy chocolate icing topped with colorful sugar confetti, dots & stars. This can be personalized with one’s special message. “Mothers always want the best for their children. They are constantly finding new ways to recreate how their child will cherish their special day,” Rivera said. Before, special two-layer cakes are only present during birthdays, debuts, weddings and graduation. Now, Red Ribbon makes it possible for families to make any day a bigger celebration while allowing more budget for other expenditures. While saving on budget, you can also share the slices of the cake with 26 people because it has a base layer of 8x12 inches and a top layer of 6x8 inches. This cake is now available in all Red Ribbon stores nationwide. As the company explores new product offerings to make every day worth celebrating for, Red Ribbon now offers its gold standard for birthday cakes in the form of its new Double Deck Dedication Cake. To know more about Red Ribbon and its many delights, visit the website at www.redribbonbakeshop.com.